As Carin becomes accustomed to her new abilities, Stryker is determined to keep her out of the line of fire. He knows these "gifts" come at a price. Meanwhile, The Accuser recruits a dangerous ally. Matt Hawkins and Bryan Hill set the foundation in issue one with the explosive and destructive arrival of The Accuser. In her wake was the shattered body of Stryker, who along with his paraplegic daughter, get an extraordinary chance to become not only whole again but enhanced. Carin has taken to her powerful working legs with enthusiasm and joy. Stryker not so much because he knows they're being used by C.O.I.It's an uneasy arrangement but origin stories are rarely simple and carefree. Whether one's powers are considered a gift or a curse, there is a price to pay in some way. Elsewhere, The Accuser uses an unorthodox recruiting method to bring Killjoy on board her crusade. This is where the action rests, with The Accuser exerting her dominance over Killjoy to convince her to join her. It's also a clever and quick way to briefly summarize her backstory. Now that the foundation of the story has been laid, this issue essentially continues the world building. The 2x4s are being cut to size, attached and raised to frame this structure that will eventually house a fully-formed Cyber Force when it finally faces The Accuser. These are the building blocks Hawkins and Hill know very well and their expertise shows in the compelling way the protagonists and antagonists prepare to collide. They know how to keep readers riveted as they build the series. Atilio Rojo shines with some kinetic artwork. Overall, the art is great but Rojo's action sequences is where the issue really elevates its game. Without words, Rojo conveys Carin's complete joy as she streaks around the track and busts through obstacles. The Accuser and Killjoy confrontation is as much about the physicality of the scene as well as the expressions on their faces. Rojo gives the issue its energy and drive. 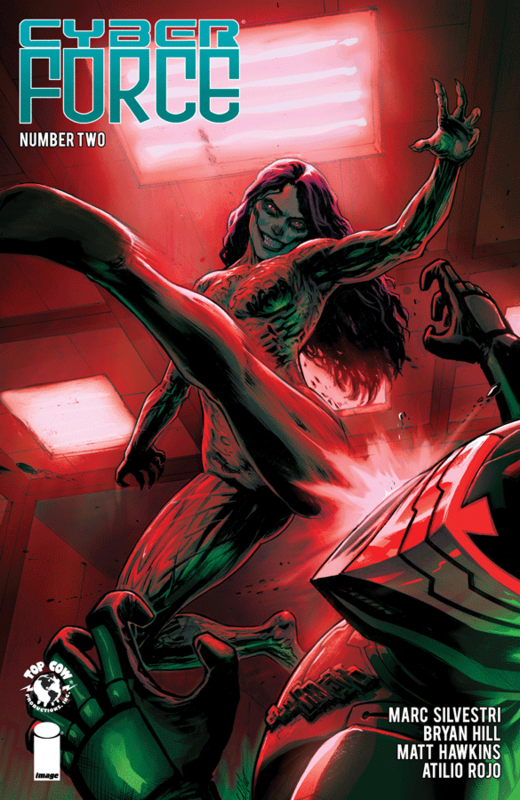 'Cyber Force' continues to build up its eventual confrontation with The Accuser as Stryker and Carin adjust to their new enhancements.Rojo's art is the MVP here, with some striking visuals that get the blood pumping. The anticipation builds making this a title worth getting on board with to see it pay off.